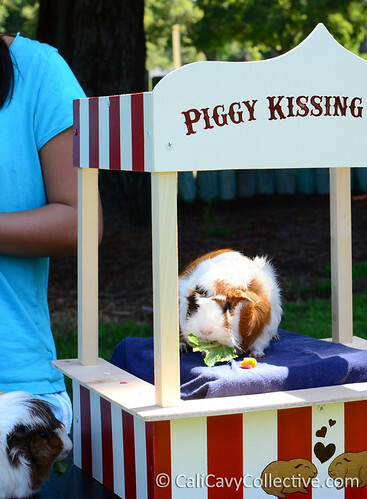 Excitement filled the air as dozens of people and their peegs showed up for the Bay Area Pignic this past weekend. After all, what guinea pig enthusiast wouldn't want to spend a Saturday afternoon surrounded by cute pigs and other cavy fans? The communal pens were a popular gathering point as people milled around to watch their cavies interacting and to pet other pigs. Nearby, Sue from Cavy House Guinea Pig Rescue had pens with a few adoptables, including a bonded pair of red cuys. 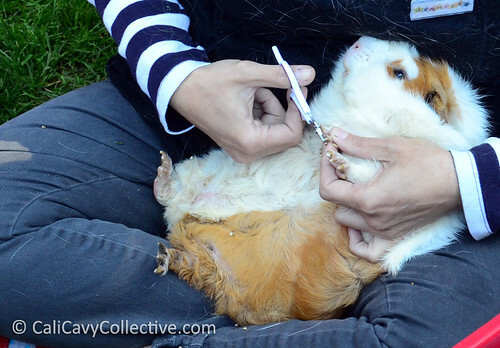 Several of the kids were absorbed in watching vet tech Jennifer trim their pig's toenails. 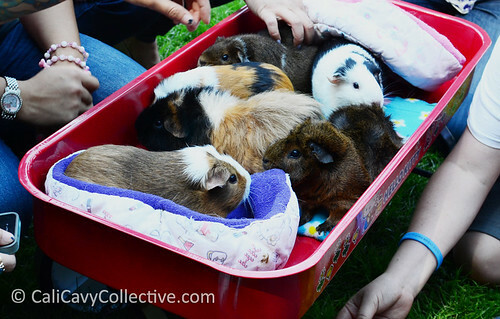 One attendee brought all seven of her pigs in a wagon... so much squee-worthy captive cuteness, all in one place! 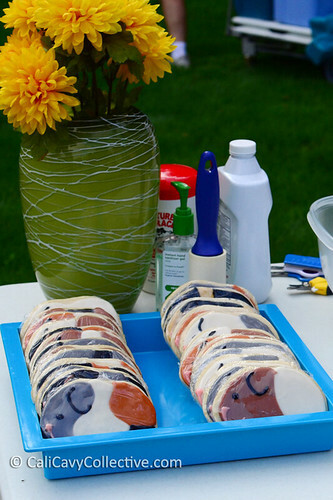 The piggy cookies were a hit and sold out fairly quickly. Other highlights included the costume contest, a trio of two week old pups, and the veggie eating contest. Of course, what pig wouldn't enjoy that? 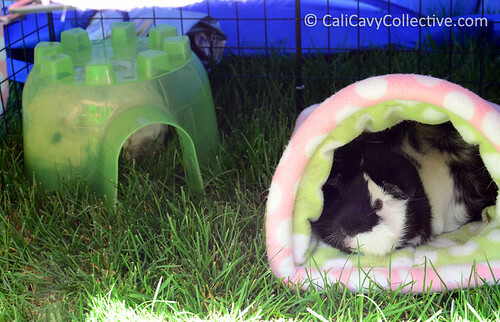 Revy and Abby-Roo stayed in their pen, shaded by a portable umbrella. Revy merrily gorged herself for the first hour or so, then spent the rest of her time lounging in a food coma. I was surprised to see how skittish Abby-Roo became in the communal pen, especially since she had a blast running around and making new friends last year. She seemed more at ease after I returned her to Revy and the comfort of her own pigloo. The day flew by as the piggy dad and I took photographs at the kissing booth. It was over before we knew it. Until next year! For more pictures view the full album. That would be so wonderful, Thankyou! If you hit "like" on the Pignic Central facebook page, they share about pignics taking place in different areas so you might hear of one near you! Oh I wish I could see something like this! Excellent! I've been awaiting your post and photos from this pignic!